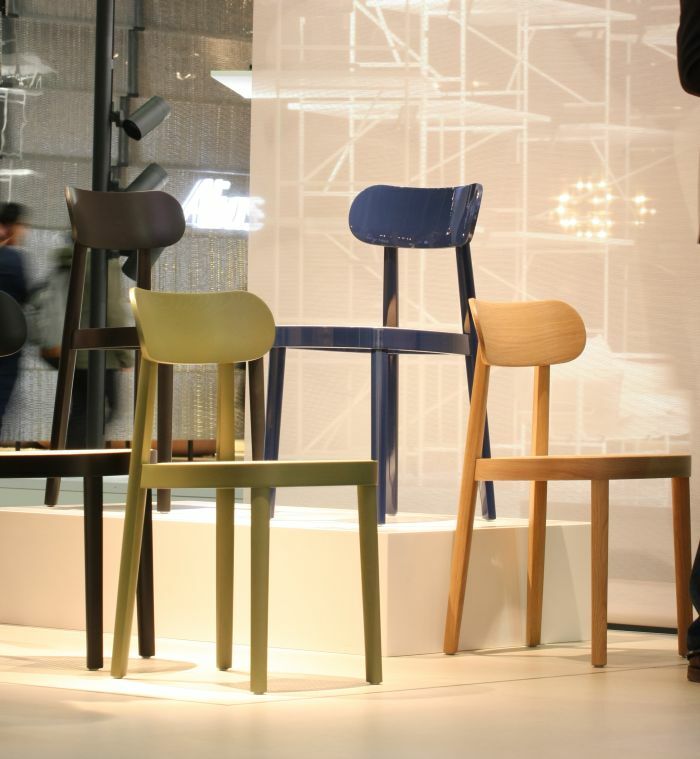 The quadratic wooden side chair is one of the true archetypes of chair design. Arguably tracing its history back to the Klismos of ancient Greece, the form is perhaps most popularly understood in its various 20th century guises, such as the Horgenglarus 1-380, that ubiquitous Swiss bistro chair; the so called Frankfurter Chair of post war Germany; and more recently in the Basel Chair by Jasper Morrison for Vitra. And now with the 118 Thonet present the “Offenbach” Chair, a nod to Sebastian Herkner‘s adopted home, and a name which contains the sort of delightfully irreverent self-irony sadly missing in the largely humourless contemporary furniture industry. A physically and visually light chair Sebastian’s principle contribution to the genre has been to straighten the back leg, a very satisfying construction development and one which moves the 118 decisively away from not only the Klismos but from all? subsequent interpretations. And a development which bequeaths the chair it’s individual character: the diagonal incline drawing the viewer’s gaze towards the centre and thus helping compact the composition, while the straightness necessitates a rethinking of the connection between seat and rear leg and between backrest and rear leg. Rethinking Sebastian has very neatly rethought. Offering a very high level of seating comfort, and with a choice of wicker or moulded wood seats and backrests, the 118 is a very contemporary and pleasingly developed chair which we are certain will become an important component of the Thonet portfolio. And so where is the confusion? Good question, to which the honest answer is that we don’t know. Which may be the real confusion. You’re confused as to why you’re confused? As regular readers will be aware we are very much in favour of Thonet exploring their archives, one the one hand because of our inherent belief that one of the more sensible approaches to furniture design is to further develop that which exists, that one mustn’t always strive for “new”. And on the other that on account of the company’s history Thonet are in possession of one of the most diverse, and at times most challenging back catalogues, a back catalogue full of potential. 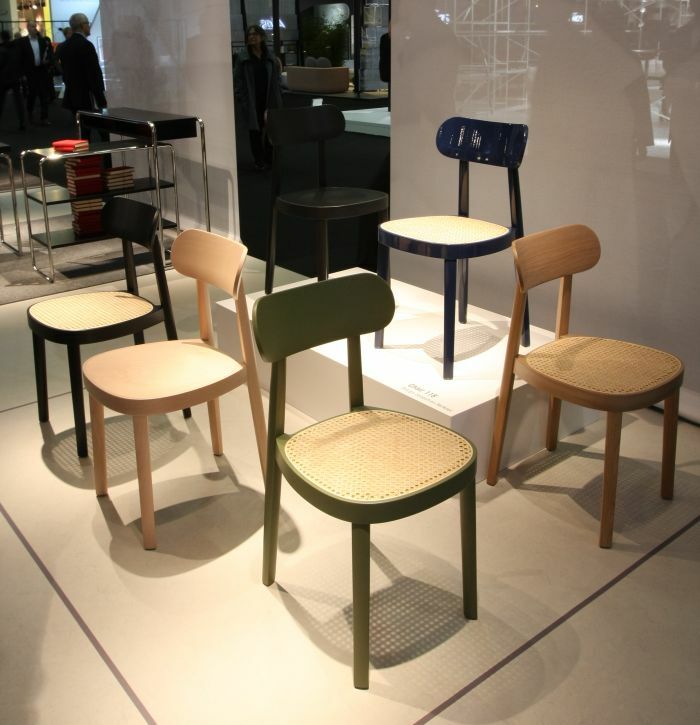 Among Thonet’s contributions to the (hi)story of the quadratic wooden chair is the B 1, originally launched in 1948 as a simplification of innumerate previous models such as the A 283, A 500 or A 674, and the 118 can be seen as a further, sensible, development of that lineage. Unmistakably a Thonet chair, the 118 is also a Sebastian Herkner chair, the diagonally inclined, straight, back leg is also found, for example, in his Clip Chair for De Vorm, somewhat hidden in Talo for Sancal or standing proudly and confidently in the focal point of Mark for Linteloo; for the 118 Sebastian has refined it somewhat and also shown his keen attention to detail in adapting its cross-section to reference the form of the seat, and thereby created a very coherent, logical, self-contained and low maintenance multi-purpose chair. …… we’d argue that much as evolution is desirable in furniture design, revolution is a necessity, and the Thonet tradition is principally one of revolution: bentwood in the 19th century, bent tubular steel in the 20th, it’s what makes Thonet the company they are, what distinguishes Thonet, what gives Thonet its unenviable bragging rights on the international stage, why every young furniture designer dreams of working with Thonet, and on a personal level is one of the reasons that we are so fond of the company and their portfolio. 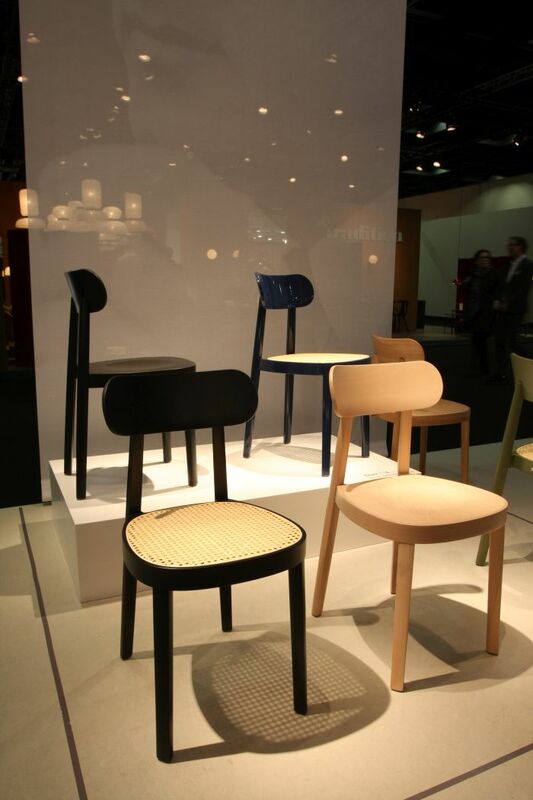 It’s not however the products in the Thonet portfolio that are important, its what the products represent. The bentwood chairs enabled new production and distribution models, the bent steel tubing enabled new aesthetic and functional standards, both made furniture more democratic, more relevant, less anonymous. New technologies, new materials, new understandings of social, economic and ecological realities mean that today new ideas of furniture production, furniture typologies and the organisation of the furniture industry are needed, new ideas which make contemporary furniture more democratic, more relevant, less anonymous. A Thonet are almost duty bound to play a leading a role in that. And for all we want them to. It’s what Thonet do. And you don’t think Sebastian Herkner can provide that new revolution? We wouldn’t phrase it that way! Come on! That is horribly, horribly unfair! We see no reason why Sebastian Herkner can’t be at the forefront of a brave new future of furniture design. And anyway it’s not about Sebastian Herkner. It’s about the chair. Throughout the Thonet (hi)story an important role has always been played by the in-house Thonet Design Team, the aforementioned B 1, for example, was an internal project, as are many of the 1930s bent tubular steel objects which remain central to the Thonet portfolio. The Thonet Design Team are in many respects the motor which drives the company. In recent years the Thonet Design Team have done a sterling job of dusting down and reformulating the Thonet back catalogue, brought through some interesting and intelligent new ideas, ideas which have helped make some long forgotten, idiosyncratic, objects accessible to contemporary customers looking for alternatives to the commercial humdrum, and thereby helped meaningfully expand the Thonet portfolio. Yet then as now the Thonet Design Team is best employed when stimulated by new external impulses, when Thonet move outwith their comfort zone, challenge conventions, and thereby challenge their Design Team to step up that gear with them, to accompany, interpret and extend the new influences and together move Thonet, move furniture, move the furniture industry, in new directions. And so for us, when Thonet work with external designers that must involve an element of danger, must take a blind curve and open a vista across the unknown. OK, yes, in the 1980s such an approach had some some truly ghastly consequences, but for us it is still the correct way to go. The 118 looks like a safe option, doesn’t give the impression of being a design led commission, doesn’t give the impression of being a project commissioned with the aim of moving outwith the Thonet boundaries, but rather of fortifying them. If you will it gives the impression of being a project commissioned to Make Thonet Great Again, rather than one which understands Thonet is great. And will remain great if it keeps being Thonet. Which isn’t to say we don’t like the 118, we do; isn’t to say we don’t think it is a successful cooperation, we think it is; isn’t to say we don’t think it will be commercially successful, it will be. Is to say that for us it points the wrong way. Maybe we’re just being impatient, maybe the big step forward is in development.